The collectivo from Ollantaytambo dropped us at Plaza San Francisco in Cusco and we were disoriented. After asking for directions from several people, we managed to find our way to our accommodation booked on Airbnb. The apartment was situated beside Wanchaq swimming pool and the neighbourhood was noticeably more local than the touristy historic centre. Our host Paul had communicated with us before hand that his sister Ruth would be receiving us. We paid 28.50 SGD per night for our room, the cheapest for the whole trip. The price should have alerted us on its (lack of) quality. Our first impression of the house wasn’t great; in fact the condition of the house kinda shocked us. While one might describe it as homey, it could also be seen as messy. It was also dusty and the renovation didn’t seem to be ‘completed’. Our room was a twin one on the second floor and there were two other rooms. One of them was occupied by a Swiss couple whom we spoke briefly to every morning. Our room was fairly spartan but it was clean enough. The bad thing was that it was outside the wi-fi range and we would need to go down to the living room to stay connected to the world. Ruth was a friendly woman and tried to make us feel at home. However, her lack of English and our inability to speak Spanish meant that we couldn’t communicate effectively. When my questions became too difficult for her, she would call Paul to ask him to speak to me on the phone. We needed the laundromat and she sent us the wrong way while the nearest one was only around five minutes’ walk away. 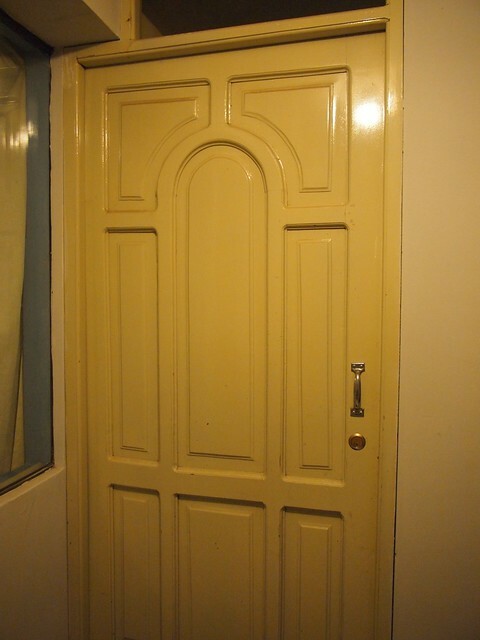 We were also given the wrong set of keys and we couldn’t enter the apartment when we returned in the evening. Ruth was out and there was no one in the house. Luckily my phone was within the wi-fi range and we messaged Paul on Airbnb. Ruth returned and let us back into the house before going out again. I had to message Paul again as the toilet paper had ran out and we didn’t know how to switch on the heater for our showers. While none of these things were really huge issues, they didn’t make our stay a pleasant one. Breakfast was included in the rate and Ruth would wake up early to prepare it for us. Both mornings we had rice with fried bananas. The fried bananas were nice but the rice was prepared too hard to our Asian taste. Ying struggled to finish them every morning. Paul dropped by on the second day and he was an interesting person to talk to. We learned more about Peru and Cusco through our conversation and his English was pretty good. That was probably the best aspect of the stay. Randall, a guest who stayed after us, had a similar experience to our time there although we didn’t have an issue with the noise. The room was very small and the building still a building site. It looked nothing like the advertised double room. The noise before midnight was very loud in the building from many sources, within the unit complex and within the unit and there were many comings and goings on the main stairs outside of the window behind the bed. As well, the light in the stairwell foyer outside the bedroom came on and off regularly. 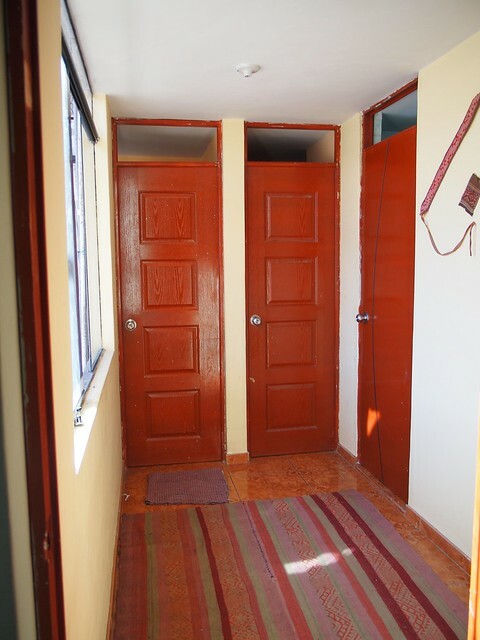 The rooms are unfinished with a space above the doors of two bedrooms and the bathroom not having glass or other infill in them allowing noise to travel and giving little privacy. The bathroom is small and when we arrived on Monday had not been cleaned and was not cleaned until Friday. It has no system for stopping water from the shower from wetting the toilet, the basin and the floor, meaning everything gets wet. A simple shower curtain would suffice. There is nowhere to hang a towel while showering so the toilet seat is the only option. The circular stair from the main lower rooms to the bedrooms is made of steel and is noisy. The light for the stair was not functioning and despite Paul saying he would fix it that didn’t happen while we were there. It felt unsafe to use at night without a torch. Paul collected us from our previous accommodation and was pleasant. Ruth was an absolute delight and made a significant effort to communicate with us. 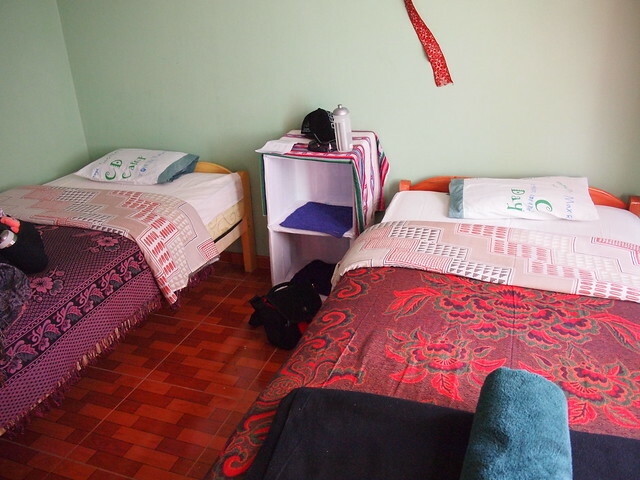 The location is fine and convenient for visiting the centre of Cusco. Not recommended for those with acute hearing, in need of sleep and any hint of claustrophobia. At the end of our two-night stay, we were glad to move on and Ruth sent us off with a small gift each. On hindsight, we should have paid more for somewhere more pleasant and comfortable. 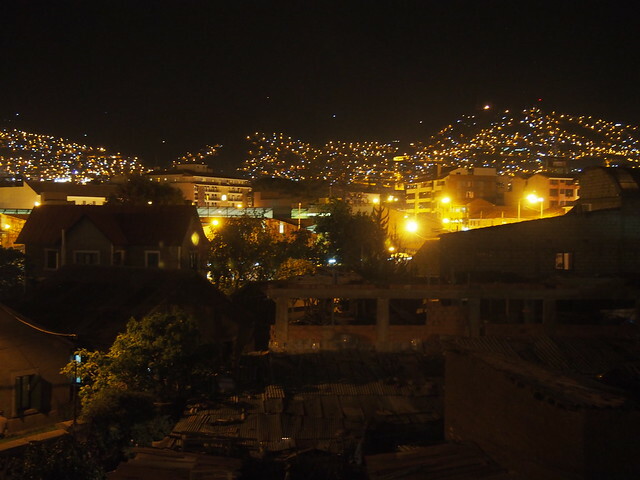 This entry was posted in Peru and tagged Accommodation, Airbnb, Cusco. Bookmark the permalink.